The Riviera floral lace wedding veil is inspired by a summer song of sweet evening notes. This heavily embellished veil is perfect for striking silhouettes and modern wedding dresses. When paired with the simplicity of a modern gown, the Riviera veil provides balance and evokes an effortless mood imbued in bohemia. This statement piece is a defining wedding accessory that’s the epitome of bridal style. Its delicate details and striking silhouette speaks to confidence, femininity and modernity. It has been designed to accentuate the grandeur of a wedding dress and pay tribute to heritage while feeling fresh and contemporary. The Riviera veil is made to order. Please allow 8 weeks for production plus delivery times. The Riviera veil falls to 300cm from the comb to the end of the train. This veil doesn’t feature a blusher layer to pull over your face. Instead, it’s designed to frame the hairline or it can be styled above a bridal bun. The lace details on this veil start at the crown and extend down to below the fingertips/knee. 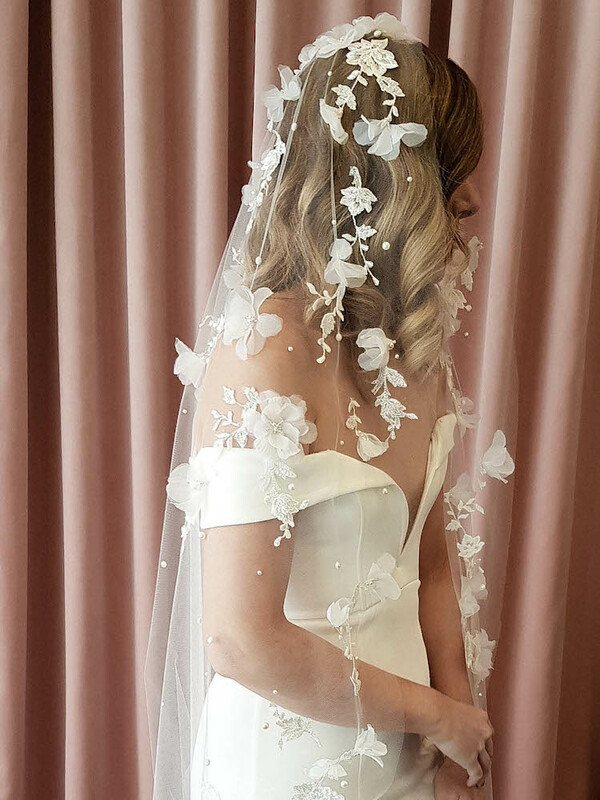 The bottom and middle section of this veil is left bare so it can blend in beautifully with your wedding dress without overwhelming it. A blusher layer can be added. This will require the lace placement to be reworked. Please contact us and we can chat about how to best customise this design to suit your wedding dress. The lace can be extended across the full circumference of the veil. The Riviera veil is handcrafted from a lightweight bridal illusion tulle in soft ivory tones only. We like to aim for a colour match or a shade lighter than your wedding dress.